The following audio examples were recorded with pianist Jon Whitten using the seven-foot Yamaha grand piano in the Colin Hill Recital Room at Cambridge's Hills Road Sixth Form College. 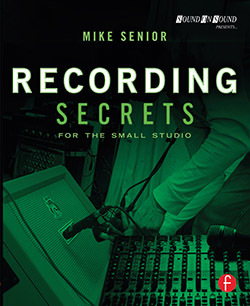 The microphones used were Rode NT55 small-diaphragm condenser mics, kindly loaned by UK distributor Source Distribution, which were preamplified via the mic preamps of a Tascam DM3200 digital mixer and recorded digitally without any signal processing. Many thanks to the college's Director of Music, Jonathan Sanders, for the use of the recital room and its adjoining control room, and also to Dan Jeffries and Tom Adams for their assistance with the sessions. This microphone setup used six Rode NT55 microphones with omnidirectional capsules. The piano was recorded by all mics simultaneously. 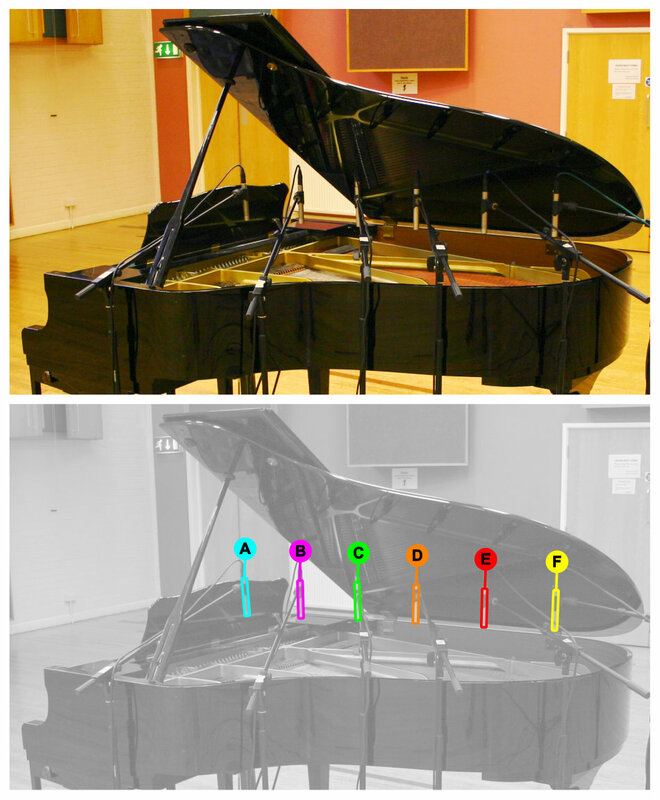 Horizontal Dispersion: These mics were all placed in the same horizontal plane so you can hear how the sound changes as you move the miking position around the piano. 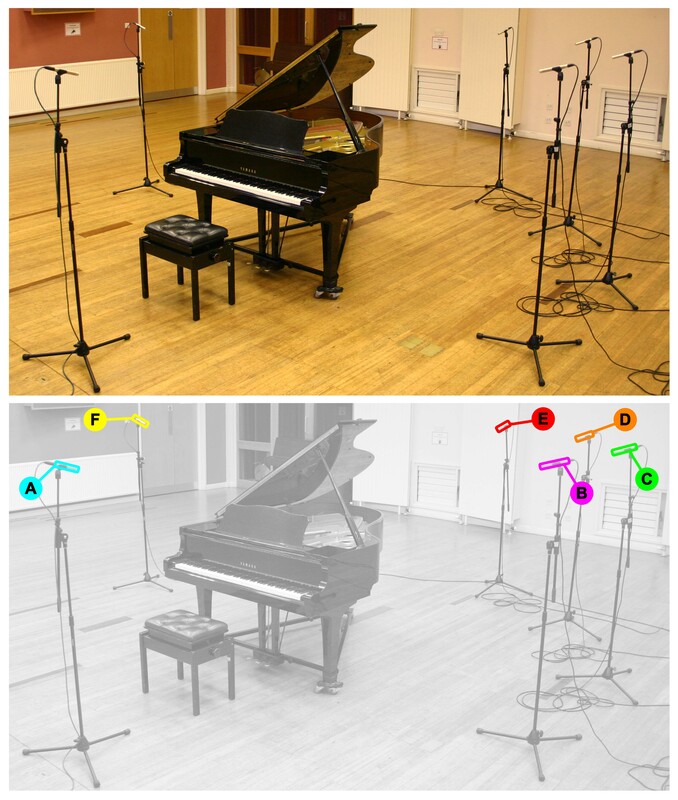 Vertical Dispersion: These mics were all placed in the same vertical plane in front of the piano at an equal miking distance, so you can hear how the sound changes as you adjust the miking angle. 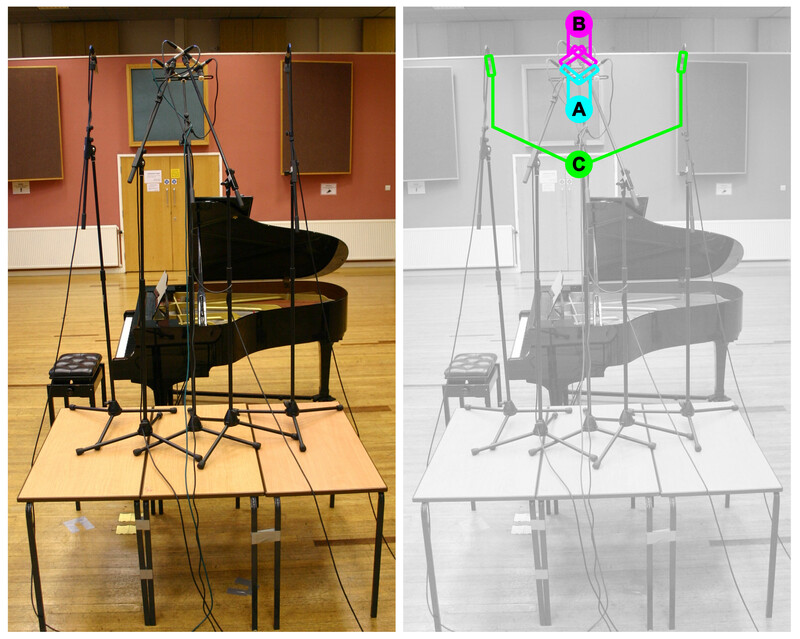 Distance Tests: Here the six microphones were placed at different distances from the instruments, using the most promising-sounding miking angle from Multimic Setup 2. This demonstrates how changing the miking distance affects the dry/wet ratio and overall tone. This microphone setup used six Rode NT55 microphones, four with omnidirectional capsules and two with cardioid capsules. The piano was recorded by all mics simultaneously. This microphone setup used six Rode NT55 microphones, four with cardioid capsules and two with omnidirectional capsules. 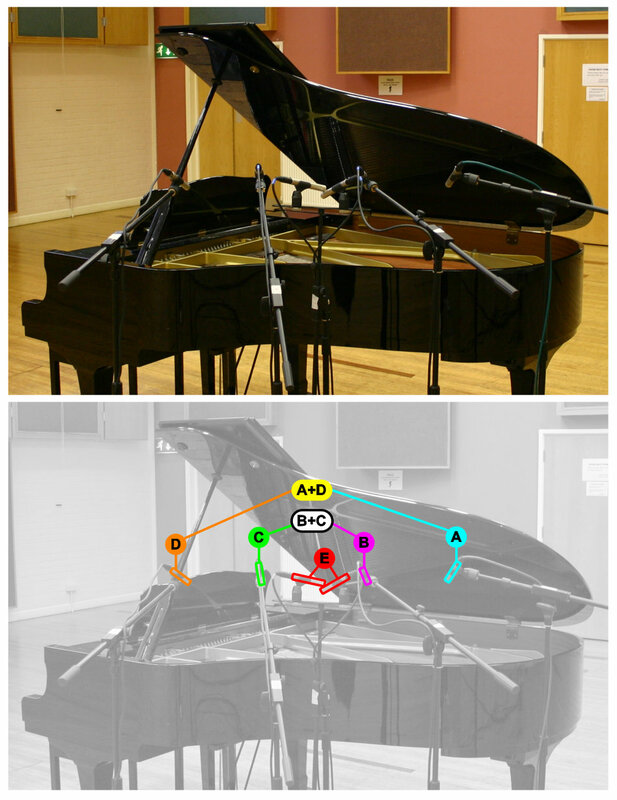 The piano was recorded by all mics simultaneously. 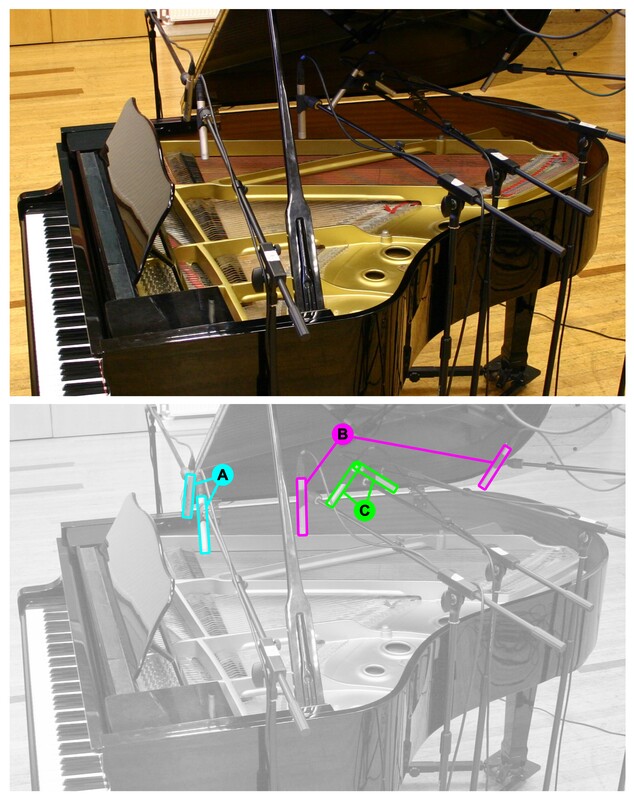 Stereo Techniques Comparison: For these examples three different stereo pairs were set up at the most promising-sounding microphone position from Multimic Setup 3: a coincident pair, a near-coincident pair, and a spaced pair. Close-miking Outside The Piano: The four omni mics were set up across the front of the piano in close-miking positions just outside the casing, along with a crossed coincident pair of cardioids. In addition, I've also mixed the four omni mics to two stereo pairs (with the mic signals panned hard left and right) so you can hear how those sound. 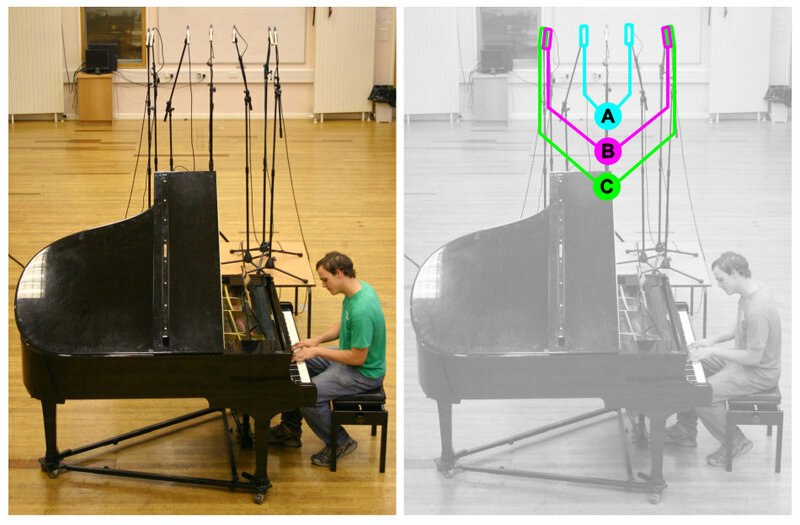 Centre-line Sweep Inside The Piano: Here the six mics are set up to demonstrate how the sound inside the piano changes as you move your mic from just behind the music stand towards the foot of the instrument. and with the piano lid open, the mics 30cm from the strings, and the omni mic capsules swapped for cardioid capsules. 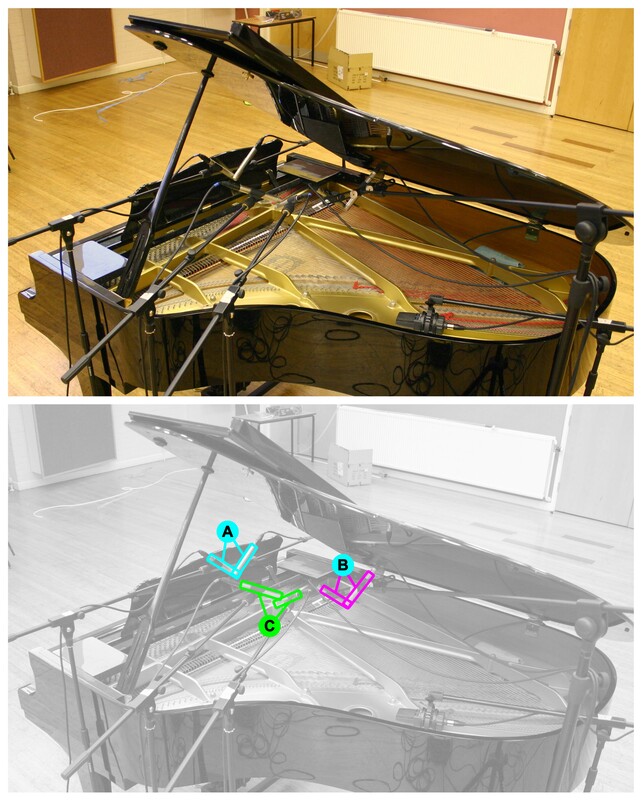 Spaced Stereo Miking Inside The Piano: Here the six mics are set up in three different professionally-used setups, two spaced omni pairs and a near-coincident pair of cardioids. Note how the sound of each changes with different miking heights and lid configurations. This microphone setup used six Rode NT55 microphones with cardioid capsules. The piano was recorded by all mics simultaneously. To read (and hear) more about recording grand piano, check out this Sound On Sound magazine article, to which the above audio examples directly relate.